When you get right down to it, many candies are made with the same three ingredients: sugar, artificial color, and artificial flavor. The question is, how can one shape and package the sugar so as to make it interesting? 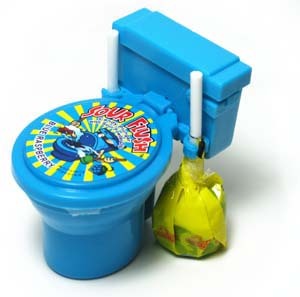 Enter the Sour Flush, a succulent pairing of sugar in both powdered and hard candy forms, conveniently packaged in a small plastic toilet. With a delicate swish of one of the two candy plungers through the powder-filled toilet, the tart delicacy can be conveyed to one’s mouth. Sour Flush isn’t simply a throw-away novelty candy, though. Once the toilet is empty, it makes a useful desk accessory. Paper clips, rubber bands, and loose change fit inside the bowl very nicely. The tank cover can also be removed if one needs additional storage. Our only beef is that the flush handle has been placed on the right, which is non-standard and would require that one special order plumbing parts if the toilet was full-sized. Sour Flush is a fine addition to the tradition of gross-out candies, cleverly pairing the functions of elimination and ingestion. (Also see Crazy Daisy, the “Super Dooper Crazy Pooper”) It is hard to overstate the appeal of this juxtaposition to both young boys and those who are spiritually or emotionally young boys. Nothing says yummy quite like eating the contents of a miniature toilet! Sour Flush is brought to us courtesy of the Kidsmania corporation. Kidsmania specializes in such clever pairings of sugar and plastic as the gas pump candy station and Ratz-Riffic, a rat-shaped lollipop paired with a candy crystal-filled garbage can.